As part of Housing Day 2018, we look at the feedback from residents who use our service and how we are helping to give them a larger voice. Housing Proactive, an Alertacall service, has received overwhelmingly positive feedback from residents in a recent customer satisfaction survey. Of the 132 residents surveyed for one housing provider, 98% stated that they were highly satisfied with the service. As part of Housing Day 2018, we take a closer look at the feedback from the survey – the ‘tenant voice’ – what the residents who use the OKEachDay devices actually feel about the service. Importantly, how by putting resident communication at the heart of the Housing Proactive service, we are enabling housing providers to substantially improve service delivery and better engage with those with higher needs living in sheltered, supported and general needs accommodation. Housing Day is a 24-hour social media event which celebrates the positive impact of social housing on thousands of people across the UK. This year the event takes place on Wednesday 10 October and focuses on ‘the tenant voice’. Housing Proactive is a housing management service which increases contact with residents regarding housing related issues by offering it on daily basis, 365 days a year. Housing providers are provided with real-time housing management reports which help to better focus resources, and enable housing teams to quickly identify where additional housing requirements are required for individuals. Importantly, the service helps housing providers keep residents better informed about on-site work or issues which may affect their property. The system enables housing teams to broadcast messages to residents at times convenient to each individual. There is also the option to send out emergency messages where needed, i.e. in the event of a power cut. 83% of those surveyed found the messaging service useful. The Housing Proactive service is currently in operation with over 40 housing providers in the UK. In each case, the service was implemented as a result of a resident consultation and viewed as a significant improvement. In the customer satisfaction survey, 96% of residents indicated that they were highly satisfied with the installation process. The Housing Proactive team plays a central role in devising resident communications strategies working with each housing provider, providing a range of literature to residents on the service and holding resident presentations to answer questions and improve overall engagement and increase adoption rates. Importantly, 96% of residents stated that they found the service very easy to use. Residents control the level of interaction they have with our highly trained and friendly contact centre team, by using specially designed devices installed at their properties (of which the OKEachDay telephone is by far the most popular). Residents press the ‘OKEachDay button’ on their device to confirm everything is OK at their property or receive a call from our team at a time chosen by them, up to 3 times a day. The service is tailored to each individual’s routines and this flexibility means individuals often better engage with the service as it’s non-intrusive and for those who would like to talk to a member of our team, they can do so everyday. Consequently, the service is often perceived as an overall service improvement. 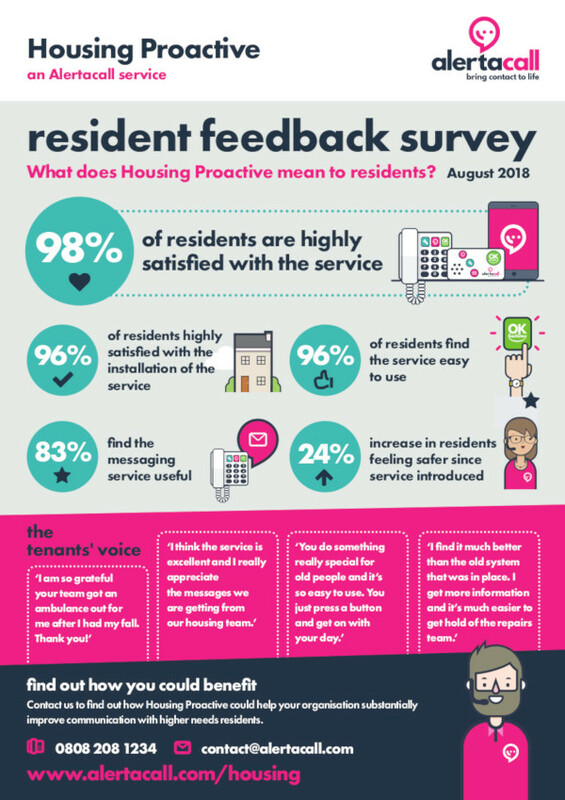 Finally, the fact that Housing Proactive enables housing providers to undertake resident satisfaction surveys much more easily than before, gives tenants a better opportunity to have a larger voice in helping to shape the future and direction of their housing service. The feedback provided from these surveys helps both the team at Housing Proactive establish where added value can be delivered, but also report resident feedback to the housing provider to help identify where service improvements can be made. For more information on how your organisation and residents can benefit from our range of housing management features, email contact@housingproactive.com or call Benjamin Lambert, Head of Client Relations, on 0808 208 1234.